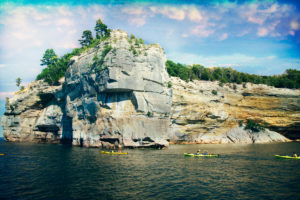 Located on Lake Superior, we cater to Kayakers, Canoeists, Paddle boarders, Hikers, and anyone who loves the outdoors. 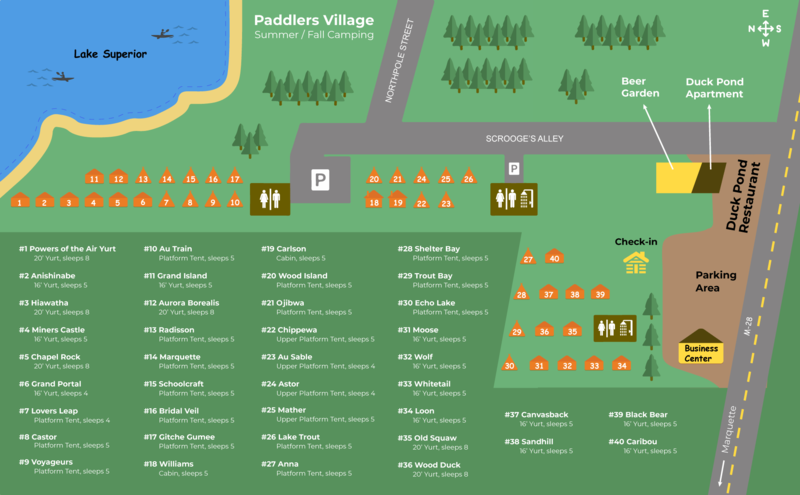 Paddler’s Village is what we consider a Modern Campground or Paddlers Resort – not an RV Park. 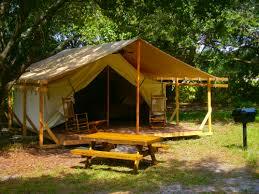 Our campsites are set up for the outdoors-man on the go. All units have beds with mattresses, a small refrigerator and a table. 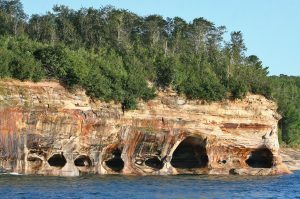 You are responsible to bring your sleeping bag, any personal items you require,and cookware. Firewood and charcoal available at our store. Paddler's Village is open for all seasons! 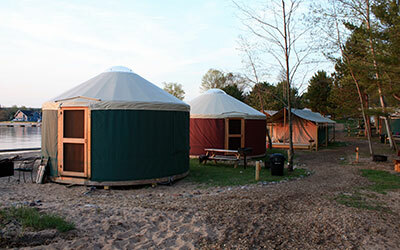 Though generally classified as a tent, the yurt is much stronger and weather tight and is a circular structure that consists of a durable fabric cover, tension band and a wood frame that includes a lattice wall, radial rafters, central compression ring, sky dome, and a framed lockable door. 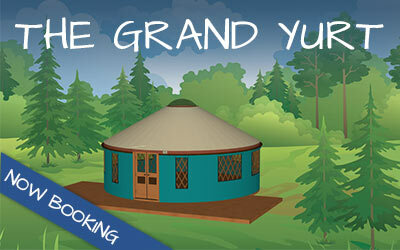 Yurts are a modern adaptation of the ancient shelter used by Central Asian nomads for centuries. 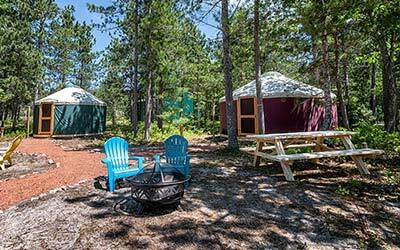 Now you can enjoy a yurt on Lake Superior. 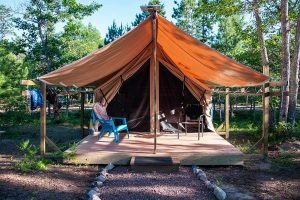 The compact shape of the yurt and combination of lightweight members in tension and compression mean that the structure is highly efficient in maximizing strength while minimizing the use of materials. 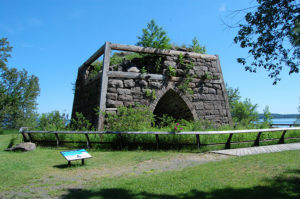 Grill and picnic table, and fire ring are located throughout the village. Bring your own sleeping bags or bedding, personal items and cookware. We do have these items available for rental if needed. Our sleeping cabins are meant for the outdoor-minded person on the go. 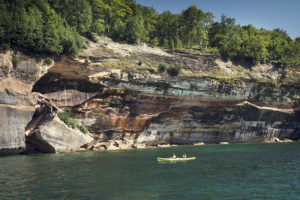 With Lake Superior a short walk from your doorstep, it’s hard to resist the urge to play on the beach! These economic cabins are relatively small, measuring at 12 x 14 ft. Each cabin has eight foot ceilings with a small front deck. They are equipped to sleep 5 people, with a futon and a bunk bed which has a double bed on the bottom and a twin bed on the top. The cabin also features a refrigerator and small table and chairs for your convenience. Several charcoal grills and picnic tables throughout the village. Electric lighting and outlets are also included as is Wi-Fi. Bring your own sleeping bags or bedding, personal items and cookware. We do have these items available for rental if needed. 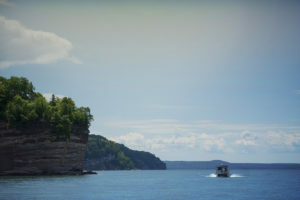 Built on a wood deck with a ridged center pole, side walls, and mosquito netting, they offer an experience like none other here in the Upper Peninsula. 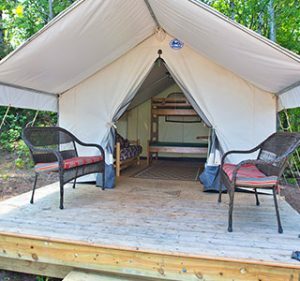 Each tent has a single and a double bunk, futon, refrigerator table and chairs, and a front facing deck with deck settee or rocking chair. The newly renovated Duck Pond Apartment sleeps 8 and is located above the Duck Pond Eatery and Beer Garden and offers our guests a more domestic experience than camping in Paddlers Village. private bath, fully equipped kitchen with all necessary kitchenware, TV, WIFI, Washer and Dryer. 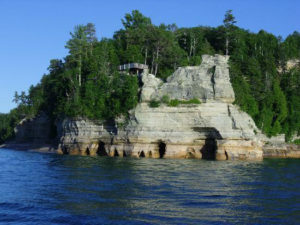 Located next to the Paddlers Village it is open year around. 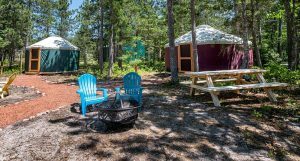 Camp on the shore of Lake Superior at the Paddlers Village with comfort in a heated Yurt or Cabin. 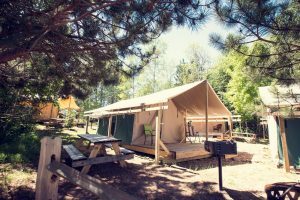 It is meant for adventurers that love the outdoors, a winter campfire on the beach, stargazing, and the cool crisp winter air. If being outside in the cold isn't your thing, the Duck Pond Apartment sleeps 7 with 2 bedrooms and a futon for beds, full kitchen, bathroom, living room, TV, and WIFI. 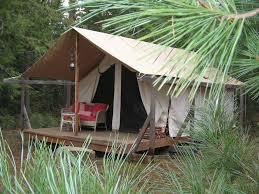 Yurts, Cabins, Safari Tents, and Tent sites are available for rental in the Paddlers Village. Restrooms and showers are located in a community building along with a dish washing station. We also have several grills, picnic tables and fire rings for your enjoyment. 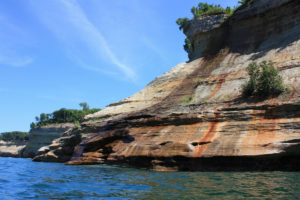 Relax on the beach with great views of Grand Island and Lake Superior. 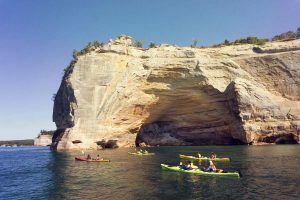 Paddler’s Village is located on Lake Superior at the western gateway to the Pictured Rocks National Lakeshore and Grand Island in the Hiawatha National Forest. 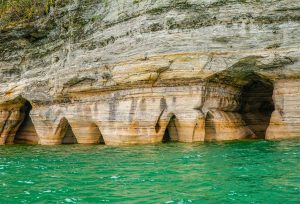 Munising, Michigan is only 2 miles east of the village and has several gift shops, restaurants, and adventure companies. 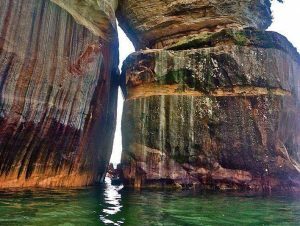 Nearby, are the Tahquamenon Falls, Grand Marias, Marquette, and the Mackinac Island area is only 2 hours to the southeast. 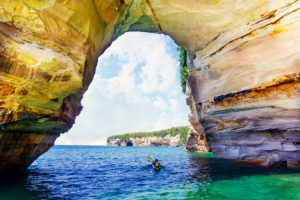 Kayaking along the shoreline at the Pictured Rocks National Lakeshore is an experience that you will not want to miss if you have the opportunity. 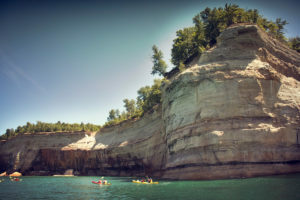 This is arguably the most beautiful shoreline in the United States and we feel that it is Michigan’s premier summertime adventure. 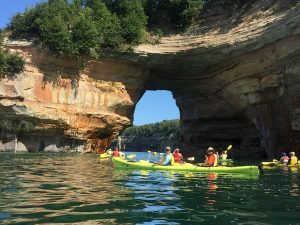 A great family adventure and fun for all. 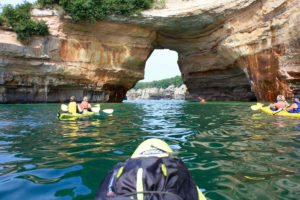 Check out and book your kayaking tour. 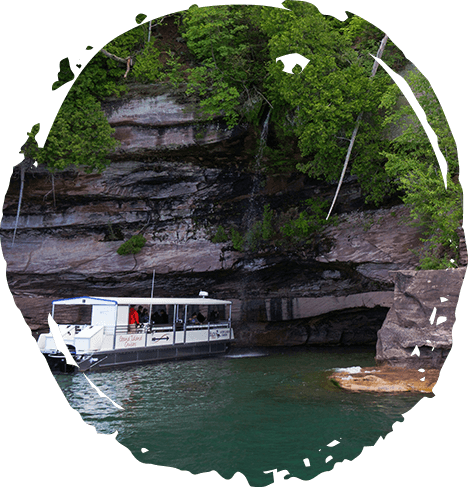 Relive the life of a French Voyageur with a historical tour.Fun and educational- A great family or group experience. 26’ North Country Voyageur Canoes. 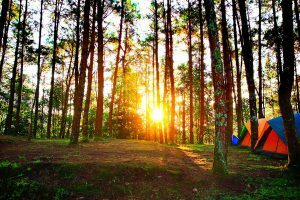 Camping isn't just a summer activity! 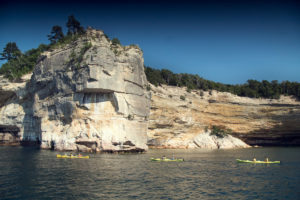 Paddler's Village is open year round for those who don't mind roughing it a bit. 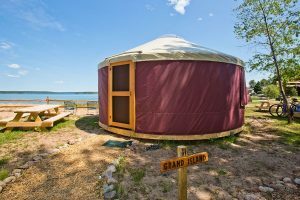 Winter Camping at the Paddler's Village is a very unique experience in camping with comfort in a heated Yurt or Cabin on the shore of Lake Superior. 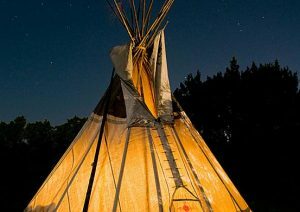 It is meant for adventurers that love the outdoors, a winter campfire on the beach, stargazing, and the cool crisp night air. 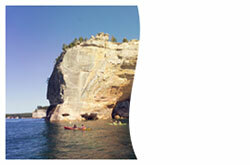 Our Winter & Spring Camping page goes into more detail. 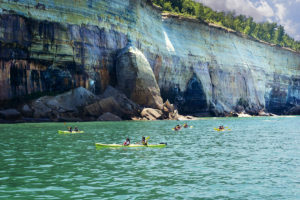 Your stay at Paddlers Village can be filled with unforgettable experiences such as taking a leisurely paddle along the Pictured Rocks or a Dinner Cruise around Grand Island that leaves from the Paddlers Village Dock , stargazing over Lake Superior, cozying up next to a campfire, and maybe even getting a peek at the Northern Lights! 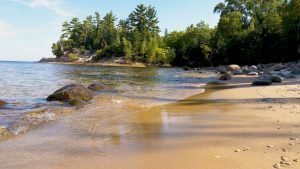 There is a 1/3 mile long beach just adjacent to our property that is open to anyone, so you can enjoy the beauty of life on the water. 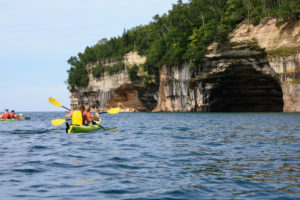 Take a look at our Hiawatha Package or Pictured Rocks Package where you can experience it all!